The Well Dressed Window in Kelowna wants to help you update your energy bills, your home security and your aesthetic with a variety of Hunter Douglas Automated designs. Set some air-conditioning goals for this upcoming summer and let us help you maximize your interior comfort get back in control of your temperature. Automated window coverings enhance your property safety by enabling you to control how much or how little they are open and when. This is perfect for those sporting events that run late or spontaneous changes in plans. Simply use your Hunter Douglas PowerView Motorized blinds app and your smart phone to adjust your needs. Enhance your privacy and security while you are away or pre-program the settings around your schedule or the sun. The choice is yours! While many are often travelling for Spring Break and summer holidays, you can now rest assured that your home will not advertise that no one is home. Enhance your security and peace of mind while minimizing looking like an easy target. Removing the need for cords and components minimizes the chances of anyone getting tangled up. Reduce the temptation for pets to chew and bat at your cords by opting for Hunter Douglas Automated window coverings instead. We handle the installation and deliver the streamlined, and functional aesthetic you crave in each room of your home. Pre-scheduling your bedroom window coverings is a great way to help people wake up on time and naturally to the sun. This is an ideal solution for those who turn off traditional alarms or for teenagers who will do anything to sleep in. Natural light wakes us up; helping us prepare for our day. Similarly, too much light pollution can negatively affect our sleep quality. Explore our Hunter Douglas blackout options for the bedrooms in your home. PowerView Pebble remotes are another way to simplify your skyline and control your Hunter Douglas automation. Hunter Douglas has remained on the forefront of wireless window technology. They have ensured their PowerView Motorization system is compatible with many other popular whole- home automation systems including security and lighting ensembles. Convenience at your fingertips! The Well Dressed Window offers a stunning selection of textiles, colours and styles to complement every room in your home. Schedule your Hunter Douglas Automated window coverings to anticipate the sunshine to obtain optimum temperatures within every room in your home or office. Custom window coverings are not just for fancy hotel suites. Transform every window to control your ambiance. Roman shades, drapery and blinds can be combined to create the serene and dark space you need for the best sleeping conditions. Energy Wise Savings Event On Until April 30th, 2018! If you have been considering updating your window coverings, now is an excellent time. Take advantage of the Energy Wise Savings event! Have everything installed and ready go to prior to our hot Okanagan summer kicking in. 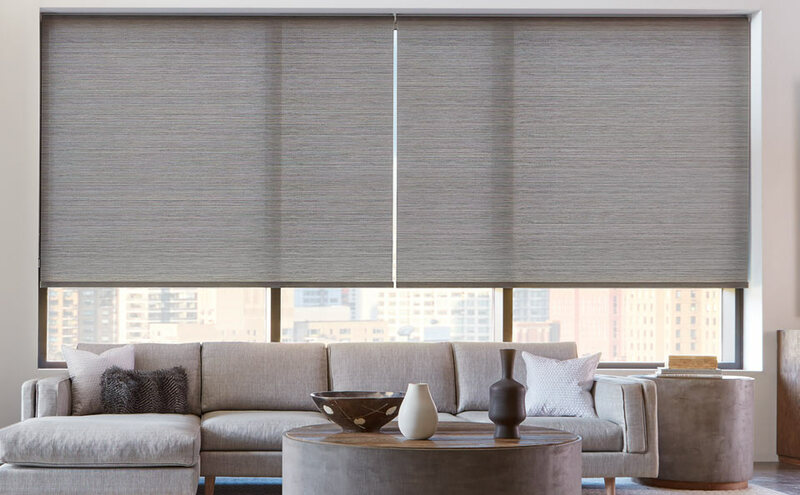 Choose a minimum of 4 Duette Honeycomb Shades with PowerView Motorization blinds and receive a rebate of $200 AND an extra $50 for each additionally purchased shade. 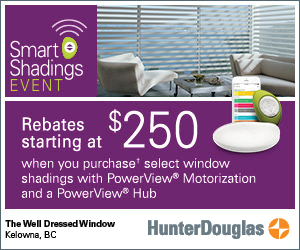 You can also take advantage for every room in your home and purchase a minimum of 4 Duette without PowerView Motorization and obtain a $100 rebate as well as an additional $25 for each shade purchased without PowerView Motorization. 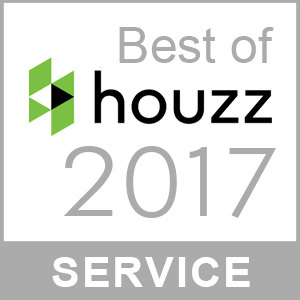 Book Your Window Consultation Today! The Well Dressed Window in Kelowna wants to help you pick out the best automated window coverings to suit your taste and budget. Call us today and we will set up a time to discuss your options, view swatches and take the appropriate measurements. We love helping clients enhance their view and solve their lighting dilemmas, while increasing their energy management. Isn’t it time you loved every room in your home?